This is the line specifies whether or not to set no-communication time in a day. When you tap this line, you will see the menu below. This is a menu to set no-communication time. You can specify whether or not to set no-communication time by tapping in the top part (1). 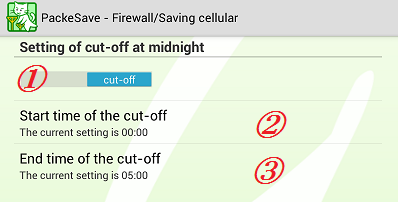 To limit the communication at certain period of time in a day, set it as [cut-off] and designate start time and end time in (2) and (3) respectively.